Lazy Susans - For the collar and torso. Heavy Duty 17-3/8" Lazy Susan for the Donut - Torso connection. 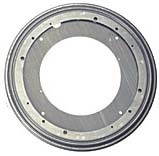 Solidly built lazy susan provides stable support for large stationary platforms. Ball bearings ensures smooth, quiet movement. 17-3/8th;''diameter. 330 pound load rating. Heavy Duty 9" Lazy Susan option for the Collar - Radar connection. These have die-cast aluminum raceways (1/2" total height). Not well suited for a costume version. Light Duty 9" Lazy Susan option for the Collar - Radar connection. These are stamped steel sheet (5/16" total height). Not suited for a costume version. Light Duty 12" Lazy Susan option for the Collar - Radar connection. Better suited for a costume version but will still need the center enlarged.